Recorded in a variety of transposed spellings including: Adnam, Adman, Adnams, Admans, Adlam, Adlum and Adnum, this is an English medieval surname. It originates from places called "Addingham" in the West Riding of Yorkshire, or Addinham St Michael in the county of Cumberland. The origin is pre 7th century, and the meaning is probably tribal from the Olde English 'ham" meaning a place, with "-ing" a tribe" and "Addie" a popular personal name of those ancient times. The name being locational indicates that it is a "from" name. That is to say a name given to a person after he or sometimes she, left their original homestead and moved elsewhere often in search of work. The easiest way to identify a stranger in the communities of the Middle Ages was to call this person by the name of the place from whence they came. Spelling being a best problematical, and local accents very "thick", often lead to the development of "sounds like" spellings. As a rule of thumb the further away from the original place, the more bizzare the later spellings. In this case we have a number of examples from the surviving registers of the diocese of Greater London, although earlier examples may exist in other places. 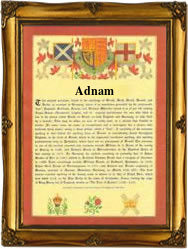 These include Anne Adman and Robert Kychell, who applied for a marriage licence in London in 1574, John Adlam who married Anne Rode at St George's Chapel, Hanover Square, in 1768, and Dorothy Adlam, who married John Mason at the same church in 1774.